For debut album by the same band, see Tea Leaf Green (album). For other uses, see TLG (disambiguation). Tea Leaf Green (TLG) is a four-piece jam band from the San Francisco Bay Area, composed of Josh Clark (guitar and vocals), Trevor Garrod (keyboards, vocals, guitar, and harmonica), Scott Rager (drums), and Eric DiBerardino (bass). Tea Leaf Green began in the fall of 1996, when Scott Rager met Ben Chambers on the campus of San Francisco State University (SFSU). Chambers was the group's original bass player but left in 2007; he is featured on the band's first four albums. Rager and Chambers began playing together, practicing in Chambers's bedroom in a back house off Church Street in San Francisco's Castro District. In early 1997, Clark, a childhood friend of Rager, moved from the Los Angeles area to San Francisco and became the third member of the band. Garrod, also a SFSU student, joined soon after. In the late 1990s, Tea Leaf Green began gigging throughout San Francisco, becoming the de facto house band at the Elbo Room for a period in 1999. The band's first album, eponymously titled, was released that same year and featured twelve original compositions, included songs such as "Professor's Blues," "Asphalt Funk," and "California," all of which remained part of the band's live repertoire for years. Over time, the band pared down the all-inclusive sound featured on the first release and formed a more focused style of songwriting inspired by Garrod's Dylanesque musings and Clark's unabashed, frenetic soloing. In the early part of the 2000s, Tea Leaf Green was an integral member of a burgeoning rock music revitalization in San Francisco that also featured bands such as Animal Liberation Orchestra and New Monsoon. As music fans from multiple corners of the country became aware of the resurgence of a brand of music focused on improvisation and experimentation, Tea Leaf Green built momentum and gained support with an ever-widening audience. Within San Francisco, buoyed by a word-of-mouth buzz, the band sold out shows at Slim's and, eventually, at the Great American Music Hall. In 2001, Tea Leaf Green released its second album, Midnight on the Reservoir, following up with a live release from the Great American Music Hall, unofficially referred to as the "Green Album" because of its all-green cover. Midnight on the Reservoir highlighted the group’s rapid evolution from its previous release, offering a heightened element of psychedelia, bombastic rock numbers, and a cohesive, thematic lyrical approach. Garrod unearthed childhood memories for the mysterious opening track "Midnight on the Reservoir" and the ebullient sing-along "Papa's in the Backroom," while the band ripped through instrumental jams such as "Panspermic De-evolution" and "Hot Dog." Clark referred to this effort as the band's "party album." In 2002, the band embarked on its first national tour, using the High Sierra Music Festival as a springboard to a more substantial audience, and was featured in the December, 2002 issue of Relix magazine. Soon, Tea Leaf Green utilized the festival circuit as a platform of introduction, playing to larger and larger audiences as it built a reputation for galvanizing live performances. Appropriately, the band's third studio album, Living in Between, was bookended by two live releases recorded in San Francisco, Slim's (2003) and Live at the Independent (2004). Living in Between again featured Clark's cover art (as had the first two albums) and demonstrated the maturation of each member's technical proficiency and a collective effort toward self-definition. The album is framed by "The Garden (Parts I and II)," components of an evolving song cycle spread over multiple albums, and finds Garrod entrenched in a lyrical romanticism touching on the folk spirit of Woody Guthrie and an American, specifically Californian, mythology charted by authors such as John Steinbeck. The heavy, Southern-rock interpretation of the traditional "Been So Long" is echoed in the politically minded "Vote on Tuesday." "Bootlegger," "Beehive," and "Earth and Sky" utilize specific American sensibilities, ruminating, respectively, on the quest for spirituality, the lessons of youth, and the processes of maturation. Other songs on the album, such as "Warmup," juxtapose Garrod's introspection with a progressive-rock confidence that abandons mere jam whimsy and illustrates a hammer-and-anvil craftsmanship. 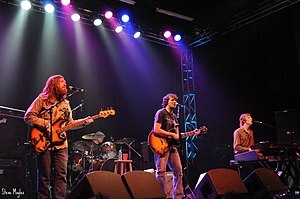 While continuing to tour extensively through the United States, Tea Leaf Green headed to Navarro Ridge Range in Mendocino, California, forsaking the confines of the city, to record Taught to Be Proud (2005), the band's fourth and, at the time, most cohesive album. With a focus on songs, as opposed to jams, the four members simplified the recording process, utilizing live takes on many of the tracks. The album is replete with radio-friendly hooks and subtly politically poignant lyricism. 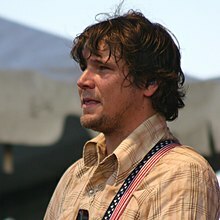 The title track earned Tea Leaf Green a Jammy Award for Song of the Year in 2006; classic-rockers like "Morning Sun," and "The Garden (Part III)" became concert staples; and "John Brown" and "5,000 Acres" utilized allegorical technique to highlight Garrod's critique of the trajectory of the American destiny. The album announced TLG as a legitimate force on the American rock 'n' roll scene. In 2006, caught in the band's rising tide, filmmaker Justin Kreutzmann, son of Grateful Dead drummer Bill Kreutzmann, directed a documentary of the band, entitled "Rock 'n' Roll Band," that interlaced live footage from a May, 2006 concert at the Fox Theatre in Boulder, Colorado, with individual and group interviews with each member of the band. The film emphasized the struggle facing a young band, capturing footage of the members at home and in the streets of San Francisco as they discuss hardship and sacrifice inherent in the pursuit of a dream. Kreutzmann utilized the Fox Theatre performance to showcase the band's distinctive musical spirit: organic but ambitious, confident but never cocky, boisterous but thoughtful, soulful and exploratory. The DVD was released in tandem with a live CD also entitled "Rock 'n' Roll Band." In 2007, Tea Leaf Green began the year playing Jam Cruise 5 and subsequently continued their exhaustive trek around the country, playing more than 130 shows, including numerous summer festivals such as Wakarusa, Bonnaroo, and High Sierra. Late in the year, original bassist Chambers decided to leave the band, citing exhaustion and a desire to be with family, and retired from active participation in the music profession. Though shaken and somewhat stupefied by Chambers's decision, the remaining members of the band agreed to persist and actively pursued a replacement for the group's departed member. At approximately the same time, the band signed its first significant recording contract, with Surfdog Records. The company subsequently released a three CD boxset, entitled Seeds, that conflated the band's first three releases into a single volume. The timing was appropriate and seemed to seal Chambers' departure with a stamp of finality. The retrospective was the precursor to the band's first new album with Surfdog. In late 2007, less than two months after Chambers's exit, Tea Leaf Green introduced Reed Mathis, of Jacob Fred Jazz Odyssey (JFJO), as its new bass player. Mathis had earned renown for his contribution to the neo-jazz, avant-garde JFJO, which he helped form in 1994. Mathis played his first show with TLG on December 7, 2007, in Santa Cruz, California. In January 2008, Tea Leaf Green entered a Richmond, Virginia recording studio with producer David Lowery, taking one week to cut a fifth album, Raise Up the Tent which was released in summer, 2008. The album opens with a Chambers-inspired funk bass on "Let Us Go," features two Clark compositions ("Borrowed Time" and "Stick to the Shallows"), and traces Garrod's musing about life on the stage and on the road. On the final track on the disk, "Keeping the Faith," Rager's drumbeat helps uncoil the ambivalence of the song: a subtle nostalgia in Garrod's voice and in the band's mellowed playing butts against the promise of future dreams fulfilled if one's desire endures. In 2008, the band played its first show overseas as part of the Jam in the Dam festival held in Amsterdam, the Netherlands. Garrod, Clark, and Rager also pursued side projects around the San Francisco scene. Because of prior obligations to Jacob Fred Jazz Odyssey, Mathis missed a handful of gigs with TLG in 2008. Steve Adams of Animal Liberation Orchestra substituted on bass for those shows in which Mathis was otherwise obliged. Near the end of the year, Mathis announced publicly that he was departing JFJO to commit more time to Tea Leaf Green. The group reprised its role on Jam Cruise in 2009, playing on the seventh edition of the event. In the winter of 2011, after playing with Tea Leaf Green to assist with a foot injury to Scott Rager, Cochrane McMillan was added as a permanent member. Tea Leaf Green continues to maintain a steady, if often arduous, schedule, playing clubs and other assorted venues across the country. 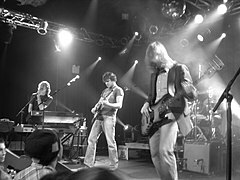 Known for extended psychedelic, rowdy, and exploratory live shows, Tea Leaf Green has made numerous performances available through livedownloads.com. Other unofficial, but sanctioned, performances are available through archive.org and nugs.net. The group, independent and often on the periphery of the mainstream music industry, continues to rely on grassroots expansion of its music through the diligence of its fanbase, community forums, and web-based music avenues such as jambase.com. In an interview with TheWaster.com, Trevor Garrod announced the official 5th member addition to the band, percussionist Cochrane McMillan, and a Spring 2011 release of the studio album, Radio Tragedy. They released another studio album, In The Wake in 2013. On August 16, 2016 it was announced that bassist Reed Mathis would be leaving Tea Leaf Green to focus on his other projects. He was replaced by Eric DiBerardino. DiBerardino had previously filled in for Mathis at select performances. For smaller acoustic shows, Tea Leaf Green has often used the pseudonym Coffee Bean Brown. During these performances, the band has utilized an assortment of instruments, including acoustic guitars, piano, banjo, cello, and mandolin. ^ Johnson, Alexandra (February 8, 2011). "Defining A New Balance of Power: The New Tea Leaf Green and Going Solo with Trevor Garrod". TheWaster.com. ^ "Live At Twist & Shout CD's". Twist & Shout Records. Archived from the original on 2011-07-17. Interview with Trevor Garrod from honesttune.com, by Tim Newby 10/31/07. This page was last edited on 18 August 2018, at 19:45 (UTC).